I was brought up on cups of tea from my grandmother while the snow trickled down outside and power cuts ruled, or on other days we watched 1940 movies on the TV. I can imagine that those occasions happened very much less often than I remember them, but as in the way of memories, we cherry pick the ones that mean the most to us for whatever reason. I’ve never really understood putting in milk before the hot water in either tea or coffee and I can’t see the fascination for the American version of Iced Tea. To me, tea should be hot and with plenty of flavour. 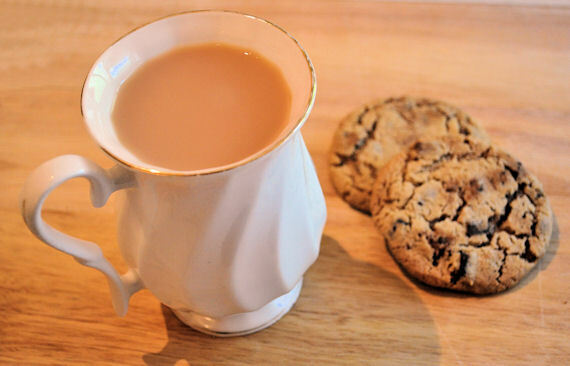 Fond memories of dunking digestives and adding the milk in breakfast tea AFTER the tea is masked in a giant teapot was the preference in our house. Tea India offered some lovely teas to try and although I’ve not been much of a tea Jeannie recently, I did used to really enjoy a cuppa. I thought it would be a good idea to get some in for summer as tea always sounds and feels much lighter than coffee on hot days. 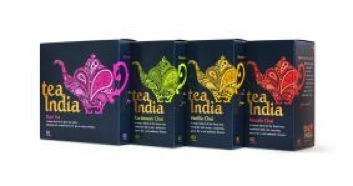 Although Tea India is a new tea, they have three authentic Chais and a black tea blend, created with more than 70 years of blending experience to get to this point. Tea connoisseurs will certainly enjoy these and Chai blends tend to be exotic and aromatic for an unusual alternative to the teas we usually have in our cupboards. There is a Facebook promotion, You & I and a Cup of Chai, which gives you the chance to try a selection of the Tea India blends for free. You will receive the award-winning Black Tea, Masala Chai, Cardamom Chai and Vanilla Chai. If you want to try it for yourself, go to Facebook to enter your details. My big box is black tea which goes down well on all occasions. The one I really wanted to try was the Masala Chai, which describes itself as spicy, warming and reviving. Containing black tea, ginger root, cinnamon, black pepper, cardamom, cloves and star anise, it seems a great tea for a cold dreich day up here in Aberdeen. I could really taste the cinnamon and as a cinnamon fan, that went down a treat. I could actually imagine the Masala Chai getting a little addictive around here. Comforting, light blend of the finest teas with sweet spices of cinnamon, cardamom and natural vanilla flavouring offers the perfect balance of sweetness and spice, ideal as a delicious evening treat or afternoon pick-me-up. For a truly distinctive tea experience, Tea India’s Cardamom Chai blends premium tea leaves with exotic, aromatic cardamom. An authentic Indian ingredient, used in many traditional sweet and savoury dishes and to flavour hot drinks, cardamom seeds are often seen as a symbol of hospitality. In true Indian tradition, this invigorating blend is a real treat for the senses and will put a spring in any tea lover’s step! This 100 per cent black tea has a high Assam content for a robust, golden flavour. Tea India’s signature blend, it has been sourced by the master blender, who grew up in Assam, north-east India. His innate knowledge of creating the perfect blend, using only the top two leaves and the bud of the Assam tea bush when the tea is at its freshest, ensures a superior cup of reviving tea every time. All Tea India blends are ethically sourced based on the Ethical Trade Initiative.